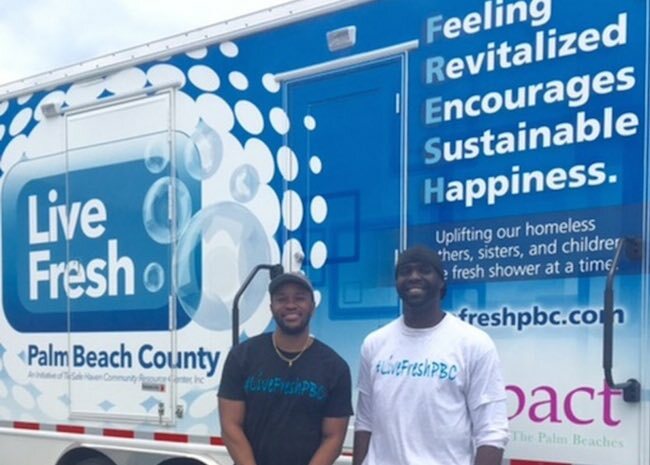 Two men in Florida have debuted a huge air-conditioned trailer outfitted with six shower stalls to help lift the self esteem and happiness of the homeless community in West Palm Beach. Chris Bentley and Carlos Miller, African-Americans living in the city who have been friends since middle school, started the nonprofit called Live FRESH (Feeling Revitalized Encourages Sustainable Happiness) which now serves showers to hundreds of transients in the area. Inside the tractor trailer on wheels are all the towels, toiletries, and supplies—including sanitary napkins—to maintain the hygiene of all who need help. “To see a human being—living in the United States, of all countries—walk inside a store with apprehension over being shunned or offensive due to their odor or disheveled state grabbed at the core of my heart,” said Miller, the visionary leader of the project. Launched in April in coordination with local homeless shelters, the services provided by this mobile facility have already restored dignity to people who were able to find a job and get back on their feet. Other cities, like San Francisco with the Lava Mae project, are benefiting from nonprofits who have converted large vehicles in the same noble cause. And, a pair of friends in Australia created mobile laundry facilities to take the cause of cleanliness one step further.